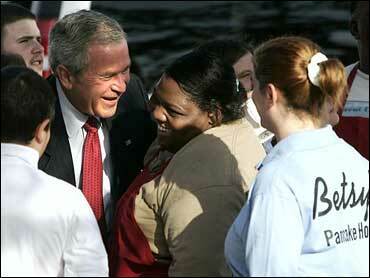 President Bush comforted this city that lost so much in Hurricane Katrina and has regained so little in the year since. Amid the raw sorrow of Tuesday's anniversary, the president selected a few beacons of hope to give a lift to struggling Gulf communities and his own still-smarting presidency. He scarfed hot cakes with happy patrons at Betsy's Pancake House, a reopened hangout in a downtrodden, flood-stained New Orleans neighborhood. He chose as a speech backdrop a new charter school viewed as a sign of the city's commitment to a better post-Katrina educational system. He called on rhythm and blues legend and local favorite son Fats Domino, who is restoring his destroyed Ninth Ward home, and replaced the National Medal of Arts that got washed away with everything else. He visited a Habitat for Humanity project nearby that is building dozens of homes for displaced local musicians. He even met the New Orleans Saints, whose return to the Superdome next month is cheered here as a symbol of normalcy in the very place that 30,000 storm victims grew increasingly desperate in the days after Katrina's strike. "The challenge is not only to help rebuild, but the challenge is to help restore the soul," Mr. Bush said in a speech heavily laced with religious references. "Sunday has not yet come to New Orleans, but you can see it ahead." When Katrina roared ashore east of New Orleans last Aug. 29, it left 80 percent of New Orleans underwater, killed 1,800 people across the Gulf Coast, destroyed or severely damaged more than 204,000 homes and made more than 800,000 people homeless overnight. A year later, New Orleans and other hard-hit parts of southeastern Louisiana haven't even emerged entirely from the cleanup phase. With insurance settlements in dispute, no master rebuilding plan from the city, and federal grants only beginning to flow to residents, significant reconstruction efforts seem a distant hope for most. Less than half of New Orleans' population has returned. But some residents are unsure their city will return to how it was. "I feel like I've been paralyzed for a year… I wanted to see what would happen and make peace with all this. It's almost like grieving for the loss of someone," Coleen Mooney, a Katrina survivor, told CBS News' Harry Smith. "I know you love New Orleans," Mr. Bush said to residents scattered across the nation. "And New Orleans needs you. She needs people coming home. She needs people, she needs those saints to come marching back. That's what she needs." Many of those who have elected to take on long-time financial hardship and start rebuilding, rather than waiting any longer for federal assistance, reports McCormick (audio). Terry Jackson, a Katrina survivor from New Orleans' Ninth Ward, told Smith he rebuilt his home almost entirely himself. "Ain't nobody doin' nothing. They forgot about us. That's what I'd tell the president... The mayor, everybody. Y'all just forgot about us," Jackson told CBS News. For those who are here, the city barely functions. Only 50 percent have electricity. Just one-third of the city's hospitals and fewer than half its schools are reopened. Violent crime is up. Nearly all the levees are patched, but it's unclear whether they would hold through another storm or whether they will be strengthened further as many want. Mr. Bush's presidency has hardly recovered, either. He was seen as personally remote from the suffering in the immediate aftermath of the storm, and much criticized as the chief of an administration that botched its disaster response. Nationally, two-thirds of Americans still disapprove of Mr. Bush's handling of the Katrina disaster, according to an AP-Ipsos poll this month. Democrats believe they can capitalize on this dissatisfaction with the government's performance in this fall's midterm elections. "I take no pleasure in finding out that the president was more incompetent than I thought," Rep. Maxine Waters, D-Calif., told reporters in a teleconference. Mr. Bush's two-day journey through storm-battered Mississippi and Louisiana was aimed in part at deflecting such criticism. He has been stressing that a one-year milestone is much too soon to judge the recovery and repeating that his administration's commitment to rebuilding has not waned. "This anniversary is not an end," the president said, from the gymnasium of Warren Eastern Senior High School, a high-performing inner-city school that suffered extensive hurricane damage and is reopening in a week as a selective admissions charter school. "And so I come back to say that we will stand with the people of southern Louisiana and southern Mississippi until the job is done." Outside, there was evidence many still need convincing. A man held a spray-painted banner reading, "BUSH FAILURE." Likewise, homeowners near the Habitat work site had signs on their front gate that said "Make Levees. Not War" and "Message to FEMA: Got trailers? We need one." The president made clear his awareness of the government's mistakes, bringing up the "terrible scenes that we never thought we would see in America: citizens drowned in their attics, desperate mothers crying out on national TV for food and water, the breakdown of law and order and a government, at all levels, that fell short of its responsibilities." "I take full responsibility for the federal government's response," Mr. Bush declared. Mr. Bush offered, as he has on his 12 previous post-storm trips to the region, a raft of promises, many of them repeats from before. He said that the government will "do what it takes to help you recover"; that there will be "a better, more effective response" to the next storm, be it the looming Tropical Storm Ernesto or another; and that levees will be made stronger, schools smarter and law enforcement tougher. He asked Congress to give Louisiana a bigger cut of royalties from offshore oil and gas production to fund restoration of storm-protecting wetlands and urged approval of federal scholarships for poor students to choose between public or private religious schools. He urged local authorities to make the decisions necessary so rebuilding rules are clear and to take the opportunity to overhaul its poor-performing public school system. And he pleaded with corporate America to locate businesses in the Gulf. Meanwhile, Mayor Ray Nagin is promising the good times will roll again in New Orleans.